Fans with a voracious appetite for AMC’s “The Walking Dead” will have a chance to walk in the footsteps of human survivors when Universal Studios Hollywood and Universal Orlando Resort debut all new terrifying mazes inspired by Season 3 of the critically-acclaimed, award-winning television series at this year’s Halloween Horror Nights events beginning September 20. This fall, Universal Studios Florida and Universal Studios Hollywood’s Halloween Horror Nights will conjure unrelenting evil in elaborately themed haunted mazes based on this year’s box office hit, “Evil Dead.” Universal is joining forces with Sony Pictures Home Entertainment to deliver an authentic experience that will immerse horror fans in the blockbuster remake of the cult classic. On the balmy evening of June 23, 2013, we launched our second year of monthly Theme Park Adventure fan gatherings at the Disneyland Resort with TPA’s Summer Nights at Sam’s! 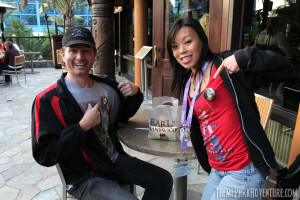 The gathering kicks off the second year that TPA has hosted a monthly meet-up at Trader Sam’s Enchanted Tiki Bar at the Disneyland Hotel in Anaheim, California. Approximately 70 theme park, haunted attraction and entertainment fans came together under the glow of Tiki torches on the patio between Trader Sam’s and Tangaroa Terrace to mix and mingle with one another for several hours while sipping awesome beverages and enjoying the warm weather!